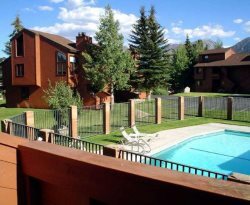 Upgraded one bedroom, one bathroom condo located in the heart of Mammoth Lakes on the green line shuttle stop to the Eagle Lodge Ski Area. There is a queen bed in the bedroom and a queen sofa bed in the living room. There is an additional twin roll-a-way bed. Sleeps up to 5. (approx. 800 Sq. Ft.). This spacious ground floor unit is all one level and there are no outside stairs to enter the unit. Corner unit is bright with lots of windows to the let the light in. 2 Flat Screen TV`s and DVD player. Fireplace with firewood provided. Remodeled kitchen and bathroom. Kitchen with granite and stainless steel appliances. Jacuzzi and sauna on-site. Swimming pool available in the summer months only. Coin-operated laundry facilities located in the common area near the office. Outside parking. Phone in unit 760-924-0327. Wifi internet access in unit. TOT LICENSE 3390-WF59. Great location. Bus stop nearby. Restaurants and shopping around the corner. Very easy to find. Close to bus stop, shopping, and restaurants. I would go back. Thank you we had a great stay. Yes we had a good time in Mammoth. The managers at the Wildflower were so nice and very helpful. Good location, spacious and great kitchen and bathroom. The location was minutes away from everything. It was very cozy and we really enjoyed the fireplace in the condo. Great place. Close to bus stop. Very convenient. Very spacious condo. Kitchen seemed to be recently remodeled. New counter tops. Nice appliances. Very clean and extremely comfortable. Staff was awesome. Next trip to Mammoth, would try to rent this unit again! Hello, thank you for having us at your lodge! Thank you again for a lovely stay at Mammoth lakes. The place is very near to all the attractions... lakes, town center, restaurants. The condo itself was clean. Kitchen had everything we needed for making breakfast...plates, etc. It got a little hot in the bedroom at night. (its 2 july) and the sofa bed springs were not very comfy. But overall nice green surroundings and great pool and hot tub. Everything was great. Nice kitchen and bath remodel. We had a really nice time. The bed and furniture were comfortable. It was a nice unit in a beautiful setting. Wildflower #59 was great we really enjoyed the unit. We also loved the convenience of having our contact right there in the complex when we needed to change out towels and get some extra TP. Well be back!